With your kind support, we raised enough funds to make the PetRescue website mobile responsive and load-times faster all-round! This is a huge deal when you consider more than two million Australians used their mobile to search for a pet via PetRescue in the last 12 months. What’s more, the new PetRescue.com.au launched with a whole heap of new search filters to connect adopters and homeless pets with their perfect match, much quicker. On the new responsive website, adopters will now be able to filter their pet search by selecting “I have kids under 5 years old” or “I have kids under 12 years old”, which means pets like Lefty the kitten have a better chance of finding their perfect family match. Hang on. There’s more. On mobile, pet photos are now bigger so that more of their adorableness is now easy to see. Mobile users can also access the directory of rescue groups, pounds, and shelters on mobile, the library of help articles, and the PetRescue account login to add pets like Raphael to their favourites list and set up pet email alerts. To see the positive change you made, search the PetRescue website today! You’ve helped save the lives of more than 84,000 homeless pets in the last 12 months by giving them the very best chance of finding a new family. That’s an increase of 15% on last year, and a whole lot of happy little faces now enjoying the love, life and care they deserve. Including our very own grumpy-faced foster cat, Bibby, who’s looking very much at home since she was adopted in January by her teen human, Kika. 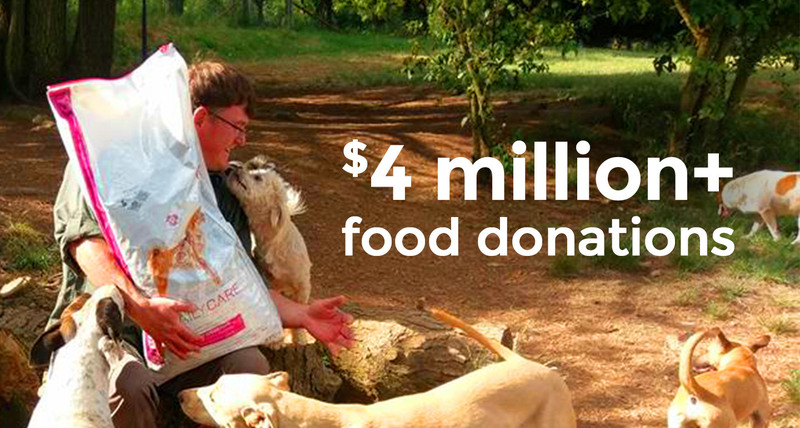 Thanks to our awesome partners, the PetRescue, PETstock & Mars Petcare Food Donation Program has made a massive positive impact in the last 12 months. Thanks to Frontline Plus and PETstock, we were able to help our rescue members keep thousands of homeless pets protected for free in 2017. With the support of our sponsors Jetpets, we’ve continued to ensure distance was no barrier to love by connecting 35 rescue pets with their perfect forever home in the last 12 months. PetRescue’s staff and volunteers responded to a record number of emails over the last year, from adopters seeking help to find a pet match, distraught pet owners seeking advice on how to find their lost pet, good samaritans needing help to rescue kittens in their community, rescue groups in need of IT support and pet lovers offering to volunteer or donate goods to their local rescue group. Be a part of our life-saving drive to find more loving homes.